I'm one of those girls who can not walk through life with the pale lips, my babylips, my lip liner and my lipsticks are the first must have in my bag, my purse, sometime my pockets, and there's nothing that I love more that have a thousands of options for each day and obviously that they last all day. 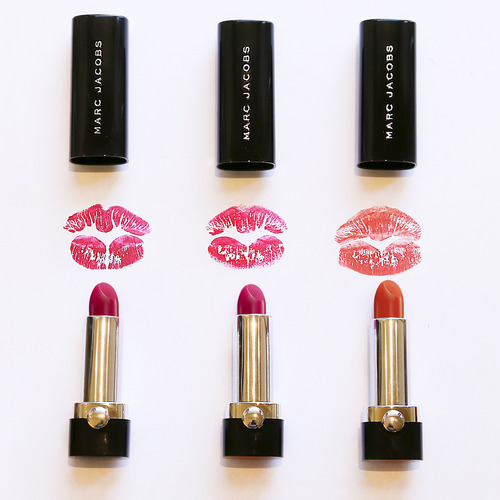 Marc Jacobs Beauty is something so irresistible, the colors are vibrant, colorful, creamy, soft. It is a pleasure to have it on my lips because they last that long. Would you like to try? If you cann't the have clothes you can have their makeup at least. I agree completely, I don't think I could go through life without lipstick! Loving these shades. Totally agree! I am obsessed with lipsticks :) love the colors!